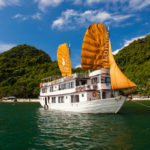 Vietnamese cuisine is one of Asia’s most fantastic foods, and there are several places in Halong Bay where you can learn to cook like a local without it costing a fortune. If you are a fan of Vietnamese food you should definitely take a cooking class, you will find out the food in Vietnam is among some of the best in the world. The floating villages draw a lot of attention and are one of the highlights of the trip. Locals have been living in these floating houses for many generations as fishing is still the villagers’ main income. Some communities offer reasonably priced home-stays to visitors, too. If you pass by them on your cruise, don’t be surprised if the boat’s on-board chef stops to shop for fresh seafood from one. 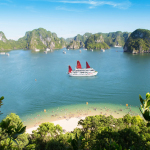 Halong Bay has thousands of limestone islands and grottoes. There are countless places to stop for swimming, fishing… when cruising around. The stunning scenery of sheer mountain cliffs rising out of Halong Bay makes an ideal backdrop to water-based activities. 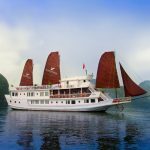 Halong Bay is the spectacular featuring thousands of limestone islands and rocks rising from tranquil turquoise waters and offers some of the most beautiful scenery in Asia. Halong Bay is also the extraordinary place for arranging kayaking trip. 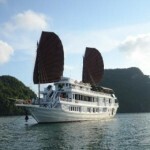 The time from April to December is the most wonderful period for Travellers to join “Halong Bay Scuba Diving”. The temperature of water at this time is from 26-29 celsius degrees. You can explore hidden beauty underwater with thousands of splendid coral such as sun mushroom coral, leather coral, magnificent stag horn coral, compact coral and fish like sergeant major fish, Clark’s anemone fish… in Halong Bay. With internationally- licensed, well- trained scuba divers and assistants, you will have unforgettable experiences.